The National Resource for Translational and Developmental Proteomics (NRTDP) is dedicated to accelerating a significant shift in how protein molecules are analyzed by mass spectrometry, with a focus on intact protein measurements. This shift in approach propels a variety of national interests in technology development, systems biology, and clinical/translational proteomics. 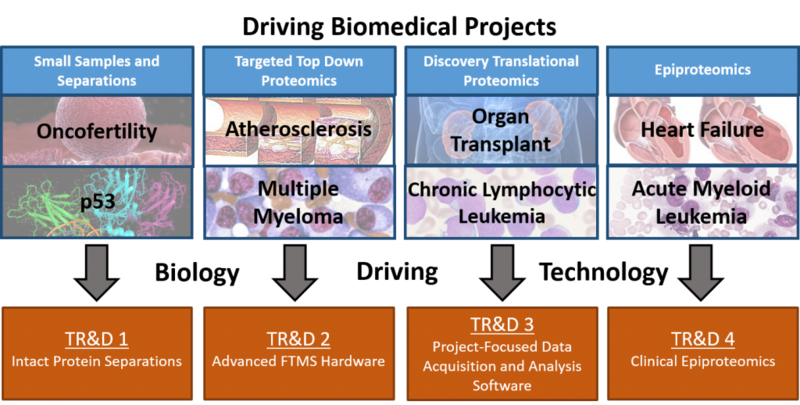 Many of our driving biomedical projects originate from clinical and basic research programs that utilize both targeted and untargeted analyses. Beyond the development of new technology, this Biomedical Technology Research Resource (BTRR) is committed to effective training and dissemination of proteomics methods to diverse laboratories and scientists. Much of this is achieved through the Scholar Exchange Program, standardized protocols and interactions through Satellite Centers.